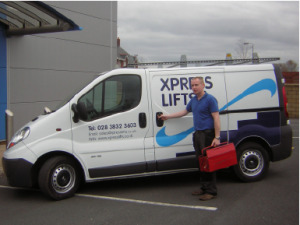 Xpress Lifts, established in 2008 by Jordan McFeeters, is an experienced local business dedicated to supplying high quality products and services to our customers. With a total of 16 years in the lift industry, mainly gained in the stairlift and platform lift sector, we have great knowledge of both the old and the new products which enables us to maintain lifts we have installed in the past and stay at the cutting edge of new technology. Get in touch with us. We are proud of the service we provide and have a long list of very happy customers. See a selection of our testimonials here or visit our facebook page to see photographs of our installations across the country.